Rafters plow through whitewater on the Gauley River. Photo courtesy River Expeditions. 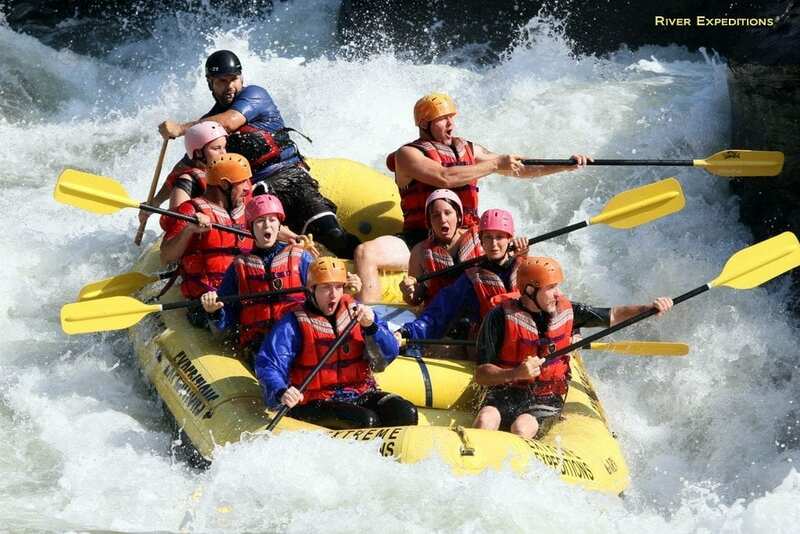 October may be the biggest month yet when it comes to whitewater rafting in West Virginia. Autumn color, Halloween fun, and the epic Bridge Day weekend add up to unparalleled excitement in whitewater country. If you’ve never been rafting before, October may be a great time to introduce yourself to West Virginia’s whitewater rivers, and if you have been, it might be an ideal time for a refresher, says Heather Johnson, vice-president of River Expeditions. “If anything sets October apart, it’s fall color. By mid-month, it’s at its legendary peak,” she said. On the weekend of October 13, River Expeditions provides a 25-percent discount on Gauley River rafting trips and rafting/camping packages and, on October 13, a Halloween costume party in its Red Dog River Saloon & Grill featuring contests, prizes, drink specials, and a deejayed karaoke party. Discounts up to 75 percent will be offered on select merchandise in the the resort’s outfitter’s store. On Saturday and Sunday during Bridge Day weekend, Oct. 20-21, rafters are eligible for packages that include rafting, three nights of camping, a barbeque cookout after the trip, and a light breakfast daily as well as discounts at the outfitter’s store and Bridge Day’s best after-party at the Red Dog River Saloon with a live, local band performing. In addition to rafting, guests of River Expeditions also are provided canopy tours and access to rock climbing, mountain biking, and a paintball field. The resort center also includes a dining hall, outfitters shop, meeting facilities, and an outdoor pool and hot tub as well as the saloon and grill, and students are welcome to stay in their choice of campgrounds as well as dozens of rustic and deluxe cabins. The fourth consecutive night spent in any resort cabins is free, Johnson emphasized. For more information on introductory rafting packages or for general information on River Expeditions, call 800-463-9873 or visit their website.